The Book Review: THE BATTLE BEGINS! The Battle Begins! is a 2003 mini-comic (it came with He-Man: The Power of Grayskull for Game Boy Advance) written by Robert Kirkman and Val Staples and illustrated by Emiliano Santalucia. This issue recaps how Prince Adam was given the sword, and He-Man encounters a number of enemies from the game, led by Clawful (the first boss in the game). There’s no story here to speak of; this is little more than the comic equivalent of a video game’s opening cutscene, an introduction to what you’ll be doing in the game. 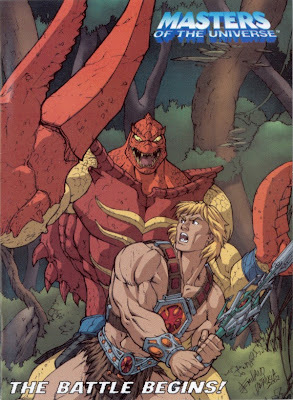 And frankly, He-Man: The Power of Grayskull was not a particularly good game. Furthermore, this comic is plagued with typos and errors. Santalucia turns in his usual fine work, but there’s really no merit to this comic otherwise.